This one bedroom cottage in Ranikhet can comfortably accommodate a group of 4 adults.There is the Master bedroom on the ground floor, besides this there is a loft to accommodate additional guests. The cottage offers a fully equipped kitchen for those who want to play with the taste and flavours of the organic garden. We provide you with a cook on complimentary basis to take care of meals. This Ranikhet Cottage ensures a high level of cleanliness and efficiency without compromising the warmth. Warm hues, comfortable beds and a relaxing atmosphere all ensure that you enjoy every minute in the bedroom. Drink your cup of tea here and all you will get is a feeling of being at a home-away-from-home. This one bedroom holiday cottage in Ranikhet that will make your heart fly with joy, your soul sing with abandon and your body dance as if no one is looking. Yes, this is just the beginning of what you will get to experience when you enter the environs of this beautifully landscaped property. Go for a walk in the nearby hills. Visit the places of interest in Ranikhet and nearby. Or simply stay put and enjoy the peace and tranquility of the place. Snow capped mountains will catch your eyes at this cottage in Ranikhet. Pine forest hills will surround you, birds will accompany you as you stroll or laze about and the serenity will permeate every atom of your being at this cottage. Driver accommodation available nearby at a nominal addtional amount. High Season rates :16 April to 31 July, October 1st to 31st, December 21st to January 5th. Renting the cottage with Cook, Housekeeping, Toiletries & all facilities at disposal. Groceries & Provisions as per actuals. 24 Hour Hot and Cold water Flat screen Colour television in each room with 24 Hour Satellite Channels. Indian Meals Bonfire on request. 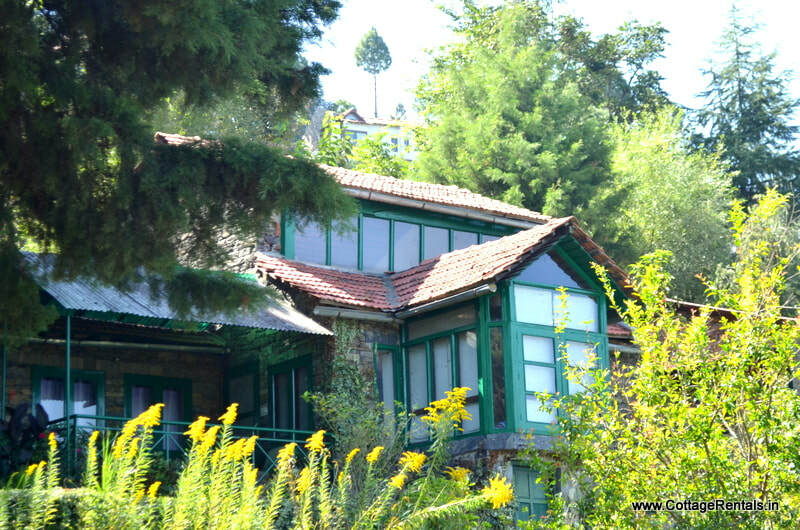 This is a one bedroom cottage in Ranikhet and can comfortably accommodate a group of 4 adults. There is the Master bedroom on the ground floor, besides this there is a loft to accommodate additional guests. The cottage offers a fully equipped kitchen for those who want to play with the taste and flavours of the organic garden. The cottage can comfortably accommodate a maximum of 6 guests. We have provision for extra beds.